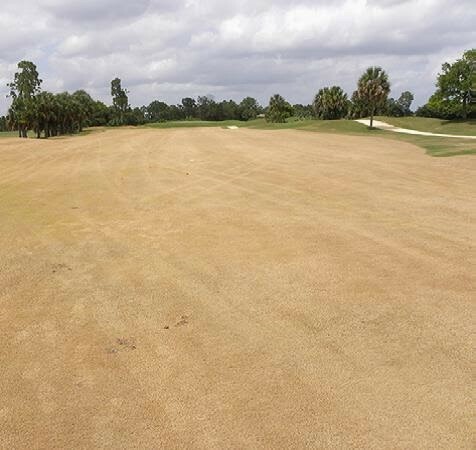 The golf course renovation starts March 16 with the application by professional contractors of the herbicide Round Up to all turf grass on the tees, fairways and rough. Round Up is a herbicide that when properly applied has been shown in decades of studies by the EPA and other governmental safety agencies to not pose a health threat to humans or pets. The Round Up will not be applied anywhere near existing plant material on the golf course or near residents' gardens. Appropriate nozzles and surfactants will be utilized to eliminate any drift potential. Within 7 days, the turf grass will turn brown as it begins to die. However, the integrity of the turf grass will allow golf play up until when the golf course is closed April 13 for the beginning of the construction phase of the golf course renovation. After the Round Up application, divots will not recover, so please remember to fill divots with sand so that those behind you can avoid landing in your divot hole. The golf course greens, the putting green and the chipping green will not have Round Up applied to them. These greens are going to be completely excavated during the renovation. They will remain green until the course closing on April 13. Round Up will not be applied to the practice tee. The golf practice tee will not be changed during the 2015 renovation work; except to add two practice fairway bunkers, one on each side of the current practice tee. The golf course will be closed from April 13 until a projected course opening date of November 15, 2015. The plan, weather permitting, is to apply the Round Up to the turf grass for two hours beginning at 6 am on Monday, March 16. Tee times will begin at noon on March 16, allowing for the Round Up to be completely dry on the turf grass before play resumes. If that plan changes because of unsuitable weather, then the Round Up application will be re-scheduled; members would be informed of that development as soon as that is known to be the case. A second application of Round Up will be made Monday, March 30, to guarantee the successful elimination of the original turf.